Who knew there were so many kinds of convection cooking? I’ve always wanted a convection oven, but I’ve always only had a countertop one. I was excited because my new JennAir range, a 48 inch standalone gas range (JGRP548WP ), has a convection oven. 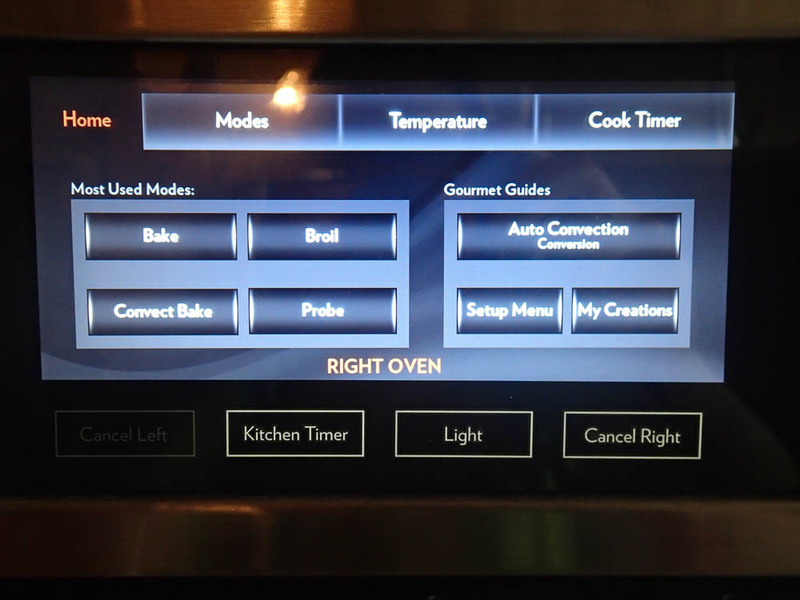 As a matter of fact, it has five different convection cooking modes. I didn’t even know that many modes were possible. I read through the manual and it doesn’t give a really clear picture of what each of the modes do. There are several that look exactly the same in the manual: convect pastry, convect frozen pizza, convect bake, and two convect roast modes. How do I know when to use what? Like I said, the manual reads very much the same for every mode and it wasn’t intuitive at all. So, I gave JennAir a call to find out how the heck I should use my new oven. My oven has three heating elements and two fans, the same as most convection ovens. The smaller oven on my range only has one fan. Convection, even in this JennAir range, uses a special convection heating element at the back of the oven and convection fans to blow the hot air around for more even heating. A traditional stove uses an element at the bottom of the stove and no fans (it’s just radiant heat). Convection makes for faster cooking, more even heating. Check out this article on Fine Cooking for more about switching over. For most recipes written for a traditional oven, you want to reduce the temperature on the recipe by 25 degrees if you’re going to use convection. This isn’t always true for JennAir, I found. The manual mentions this a little, but never really says why. JennAir said some of their modes automatically correct for the change in temperature, but I think it’s more that some modes don’t need to be corrected for because of the nature of the food. My stove does have an “automatic conversion” mode, but it’s not enabled unless you enable it. It seems like JennAir is saying fussy things (like baked goods) need to be converted, but not so fussy things, like roasts, do not. I don’t think there is some automatic conversion happening. I think it’s just that roasts aren’t as fussy about temperature, so it doesn’t matter as much. You do need to watch your food, because things cook much faster in a convection oven. It will take some practice before I get used to the cooking temps and times with the convection mode, but my first batch of cookies turned out perfectly. It seems like the main difference between all the convection modes is the fan speed, and if the fan stays on the whole cooking period. That’s not very clear in the manual at all. I’m mostly blogging this so I can have a reference later. I’m bound to use the paper I scrawled it on, but maybe it will save someone else a call. This isn’t true for all Jenn-Air ovens. I found a manual for their wall ovens that is clearly different from what my oven manual says. This seems to be true for all the pro-style, standalone ranges, however. Bake: Bake is just the bake element (the bottom element), like a normal stove. Keep warm: I didn’t ask about this one, but it seems to be be “bake” at a low temperature for a sustained period of time. Broil: The broil element (at the top) only. Convect bake: According to JennAir, you do need to do the -25 degree temperature conversion with convect bake. During this mode, all the convection elements are on (both fans and heating elements) and the bake burner (the bottom element) with a low fan speed. The elements and fans cycle off and on. Convect pastry: According to JennAir, you do need to do the -25 degree temperature conversion with convect pastry. 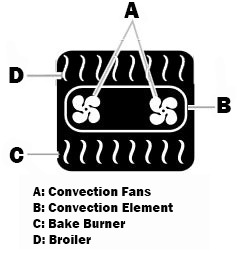 During this mode, all the convection elements are on (both fans and heating elements) and the bake burner (the bottom element), but the fan pulses from low-to high speed. The elements and fans cycle off and on. Convect Roast: You do not need the -25 degree temperature conversion for convect roast. Convect roast uses the convection elements, the bake burner and a high speed fan. This creates a super dry, hot environment to sear the outside of meats and poultry. The heating elements cycle off and on, but the fan stays on. Convect Slow Roast: You do not need the -25 degree temperature conversion for convect roast. This mode cycles all elements and fans on and off for roasting long hours (4 hours or more). The heating elements cycle off and on, but the fan stays on. It’s the same as convect roast, but it cycles on and off. Convect Frozen Pizza: According to JennAir, you do need to do the -25 degree temperature conversion with convect frozen pizza. It uses all the convection elements, the bake burner plus a low speed fan to thaw and cook the pizza. The elements cycle off and on, but the fan stays on the entire baking period. Proof: Proof is the bake burner (bottom) only, at lower temperatures for proofing dough. Rapid Proof: Rapid proof should be called convect proof. It uses the bake burner (bottom) and convection element (back). The fans are not used. I made this chart after with the info. I’ll be putting this in my kitchen. They told me about Convect Broil, but my stove doesn’t have that. You do not need the -25 degree temperature conversion for convect broil. Convect broil uses the broil element and a high speed fan. It does not use the convection heating element. My stove has a regular broil, which just uses the broil element. I think it would a good idea to add the fans to it, but as far as I can tell, my broil is just a regular broil.